NJ Chimney, Fireplace, Roof & Dryer Vent Repair, Service & Cleaning- chimney repair nj- roof repair nj- Certified chimney sweep and mason.. Caused by a build-up of exhaust byproducts (creosote) due to insufficient combustion that when heated up, ignite in the chimney. Temperatures can often exceed 2000 degrees during the fire-- flames can leap out of the chimney and travel through cracks and chimney walls. These flames can ignite framing within the walls as well as bushes & trees outside the home. This excessive heat damages chimney liners, cracks chimney walls and can damage many types of factory-built metal chimneys. 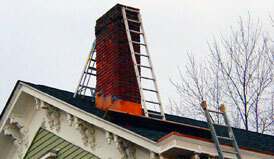 Your chimney should be inspected & cleaned by a certified professional at least annually. Why do I need a cap? Caps keep out rain, which can form lye inside your firebox and destroy firebox walls. They also keep out rodents & pests, which can contaminate your house with bacteria & insects. Your dryer vent should be cleaned twice a year. How often should I clean my air ducts? It is recommended & HVAC systems have a cleaning occur once every two years. This helps promote indoor air quality and allows your heating/cooling plant to function efficiently. Why does my chimney leak? There are many reasons why your chimney may leak, such as: missing cap, a cracked & deteriorating crown/wash, deteriorating mortar joints, leaking flashing, a bad roof, missing cricket, etc. Why did my furnace or boiler chimney get clogged? The exhaust byproducts can be very acidic and when mixed with condensation, which commonly occurs, can create an acid mixture which will deteriorate your flue lining. Pieces of flue lining and chimney will accumulate at the base of the flue where the breech from your furnace or boiler is made. When this occurs, your chimney is clogged-- and now exhaust byproducts, such as carbon monoxide, are contaminating your living space. This is why all heating plant flues, including hot water heater flues, should be inspected once a year by a certified professional. Proudly serving Ocean, Monmouth and Middlesex Counties since 1989. We utilize the latest tools and technologies to solve many of the chimney, fireplace, heating, carbon monoxide and general venting problems that arise today. Whether or not you choose Certified for your chimney needs, always make sure that your contractor has insurance specifically for chimney work-- this is a difficult policy to obtain and many chimney contractors do not have the proper insurance. Make sure required fields (*) are completed. Use this space for describing your problem. Certified will contact you within about 48 hours.